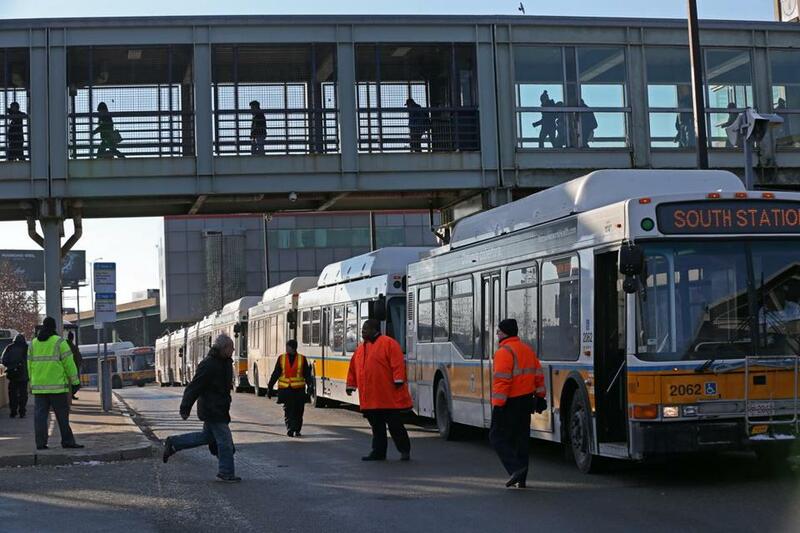 The MBTA brought in buses to serve riders at the JFK station after cracks in the third rail caused by cold weather brought train service to a halt. MBTA General Manager Beverly A. Scott called for an audit of all third rails on the Red, Orange, and Blue Lines on Wednesday after two of the rails cracked in two days, causing hours of delays and stranding thousands of subway commuters. The rare cracks disabled the Braintree and Ashmont lines at the JFK/UMass station, with the first appearing during the Tuesday night commute and the second Wednesday morning. The third rail provides electricity to trains, so they could not run until the rails were repaired. The troubles on the Red Line came as Massachusetts Bay Transportation Authority officials began to outline plans to institute widespread fare increases on July 1. Most fares will increase, in part, to make up the difference for reducing the cost for The Ride, the T’s door-to-door transit service. Subway and bus commuters will likely see fares rise by slightly more than 5 percent, said T officials, adding that they would also examine instituting peak and off-peak fares. Officials said they believe sub-freezing temperatures led to the cracks, causing the metal to contract and creating 1- to 2-inch gashes where the rails are welded together. They were first detected by power department dispatchers. “They could tell there was a spot where the trains were losing power,” said Joe Pesaturo, MBTA spokesman. Though cracked third rails are rare, they are not a dangerous problem — without power, the trains would simply come to a stop. But as winter officially begins next week, Scott is hoping to ensure that similar problems do not crop up. She has asked for T officials to deliver a plan to conduct the widespread audit by Thursday. “We want to make sure this isn’t systemic,” Pesaturo said. The crack found Wednesday ruined the morning commute for many. It was discovered shortly after 7 a.m. on the northbound tracks of the Ashmont Line, Pesaturo said. Service was restored shortly after 11 a.m. In the interim, 20 buses shuttled commuters between Ashmont and JFK stations. Space on the JFK/UMass train platform was limited as commuters packed the station waiting for the buses and trains. Mike Digiacomo, who rides the Red Line from Braintree to Alewife to get to work, said he arrived 15 minutes late to the office because of the delays. He said commuters were packed into every station, but many could not get on his train because it was already full. Tuesday night’s episode also occurred at JFK/UMass station, on the northbound tracks of the Braintree line. The cracked rail was first detected at around 5 p.m., Pesaturo said — a problem that added to Red Line delays, which had already begun at 4 p.m. with a disabled train. Meanwhile, members of the Transportation Department board voted Wednesday to roll back prices for The Ride, beginning Jan. 6. Within the next several months, the T will also provide free subway and bus passes for Ride users to encourage them to use those services instead. The T’s decision to lower the fares for The Ride from $4 to $3 is good news for senior citizens and people with disabilities, many of whom suffered when the cost of The Ride was doubled in 2012. The changes will cost the agency $6 million a year, said MBTA chief financial officer Jonathan R. Davis. To make up for that loss and pay for other services, officials are looking to raise ticket prices to provide an overall 5 percent increase in fare revenue next summer, he said. Because the $3 Ride fares will not increase, the prices for subway, bus, commuter rail, and ferry passengers will probably all rise more than 5 percent. “We want to distribute the burden equally,” Davis said. A 5 percent increase would raise the price of a single CharlieCard fare by 10 cents and the T’s monthly subway-bus pass by $3.50 to $73.50. The details of the July 2014 fare hikes must be worked out by April 15, Davis said, and T staff will hold multiple public hearings before then. The planned price increases are part of the T’s aim to increase its funding through incremental fare increases every other year, rather than significant jumps once or twice per decade. “We believe the shock of a 23 to 25 percent fare increase is not the correct way,” Davis said. Dozens of seniors who attended the Transportation Department meeting praised officials for lowering fares on The Ride. Several said the fare decrease meant they would be able to more frequently attend church services, go grocery shopping, and make doctor appointments. She urged T officials to develop a timeline for creating an income-based fare structure. At the meeting, Davis also offered new details on other changes to the overall fare system officials plan to consider, including peak and off-peak prices — which will become possible with a software overhaul, Davis said. Additionally, officials are looking to decrease cash transactions and may institute a discount at T parking lots for people who pay with their mobile devices. After the meeting, Scott said the transportation finance package passed by the Legislature this past summer has put the T on much firmer financial footing, which will allow the transit agency to take a long-range look at creative or unconventional funding opportunities such as a university T-pass program or income-based ticket prices. Globe correspondent Jasper Craven contributed to this report. Martine Powers can be reached at martine.powers@globe.com. Follow her on Twitter @martinepowers.